So I made it to Chile. I arrived on Tuesday morning at about 11am. Was it what i expected? No. I have been told that when you get to South America you are swamped in the South American culture but I don´t think i have yet. Chile is supposedly one of the most developed and stable country in South America. To tell you the truth given the language and the look of the people here I sometimes forget I´m in Chile and not in Spain. I got a taxi from the airport straight to the Spanish school which I´m going to be going to for a week. I made the mistake of telling the driver I was going to learn spanish and so he pointed out everything on the way and said the word in spanish. By the time i got to the school i was already all spanished out!!! That turned out to be unfortunate because at the school they don´t speak to you in English. Por que? Because that´s the best way to learn spanish! The conversation which followed was pretty much beyond me but the end result was that they took my payment and I was clearly, without doubt going to be best off in the absolute beginners class! Completely jet lagged I listened and spoke my way through my 4 hour class. It was tough and my brain wasn´t functioning that well. But it wasn´t over after that. 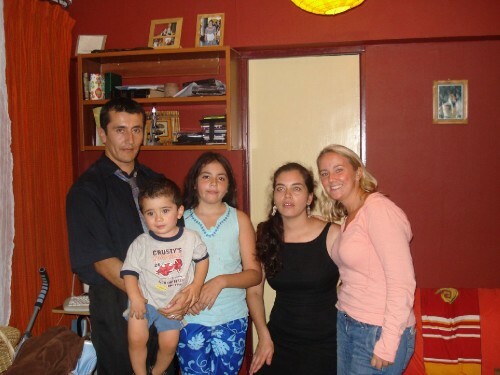 I was then picked up by my spanish family Zaida (mum), Mariana (sister aged 10) and Noel (aged 1 and a half). The introductions were fairly amusing as my spanish is still very poor and the family don´t speak english. That night what many of you thought would never happen actually happened. I WAS SILENCED. I had so many things i wanted to say but couldn´t say them in spanish and nobody understood if i said them in english so i just didn´t say a thing!! That night I really did question what I was doing there. In a city... in a country... in a continent where i know nobody and where it seemed like nobody spoke english!! You´ll be very glad to hear that since then it´s got better and i´m now absolutely loving it (it´s amazing what a good nights sleep can do for you). School is fun. It´s great learning again. I have made friends at the school and the family I live with have treated me like another member of their family. They are so lovely and look after me so well. My Chilean Father, Rodrigo, speaks English quite well and so i even get a bit of a chat with him in English. We generally start off in Spanish and then i get stuck on a word and we end up in English. I do try though. As for my Chilean Mother, Zaida, she chats away to me and i understand some of it (i think). When i figure out something to say myself i give it a go and she´s patient enough to listen and tell me where i´m going wrong. So my spanish is now getting better. Unfortunately, I still can´t get myself out of the habbit of using french words everynow and again; generally when i don´t know the spanish word! And when i don´t know the french word i use the English word but say it in my best spanish accent. Sometimes it works! I´m going to school in the afternoon 2pm til 6pm so i´ve been trying to get out and about in the morning. One day i went for a wander through Bellavista which is a really nice part of the city not far from where i am staying. It´s a little bit arty with nice shops, pubs and restaurants. From here i headed onto San Cristobel which is a mountain park which you can get a funicular up and see views of Santiago from. The day i went up it was a bit overcast but the views were still great. All the way around you can just see buildings which seem to stretch all the way to the mountains. Another day i went into the city for a wander. I found a huge cathedral which was nice and the central mercado which seemed to have restaurants and very smelly fish markets. It was a nice wander though. Then on Friday i went out with some school friends for a night out and i tried my first Pisco Sour. It´s the local drink here which you have with lemon and sugar. It was nice but it´ll never replace my usual tipple of a vodka and diet coke. Today I went on a school trip. It´s the best school trip i´ve ever been on - it was too a vineyard. The trip included a tour of the vineyard followed by some wine tasting. After all the time that i spent in Australia, I had never made it to a vineyard so I thought that i should defiinitely do it in Chile. It was about the time that the tour guide started to speak in Spanish that I had the thought that it may have been a better idea to do the trip in Australia where they speak English!!! I did however, understand some of it and the tasting was fun! So that´s my first few days over. After an unsure start i´m now loving it and toying with the idea of an extra week here at the school and cutting my time down in Ecuador. We´ll see what happens.